In short: What consumers expect from search engines has evolved, and search engines are changing to meet these expectations. Marketers need to adapt to the new search ecosystem. If we’re still optimizing for Tarzan, we’ll miss an ever-increasing amount of traffic. 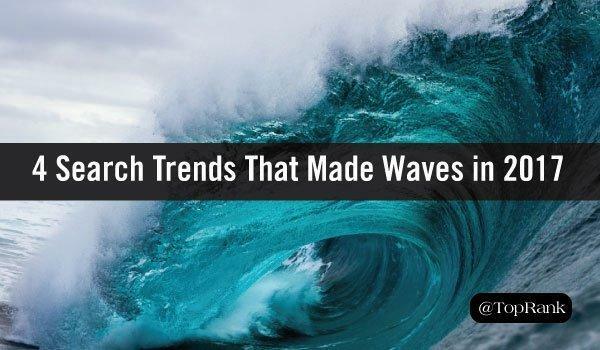 Here are four major trends in search that made waves this year, and will continue to reverberate in 2018 and beyond. This first trend is the newest on the list, but it seems poised to change the search landscape substantially in the future. When every smartphone has a built-in camera, why bother typing or speaking queries when you can search with a picture? Google Lens is an app that can identify buildings, products, text, and read barcodes – and it uses machine learning, meaning it’s going to get more sophisticated over time. Right now, you can take a picture of a movie poster, book cover, or even consumer products like shampoo or mouthwash, and the app will serve up search results based on the image. The technology isn’t perfect yet, but it should be on every marketer’s radar. Five years ago, the only reason to talk while using a phone was if you were having an actual conversation with another human being (gross, I know, but those were different times). Now, a growing number of conversations are with Siri and the nameless Google Assistant. Voice search has exploded in popularity, rapidly approaching the tipping point when it will overtake typed search. Studies say one in five consumers use voice search on their smartphones, and industry experts predict 50% of all searches will be voice searches by 2020. Voice queries tend to be more complex, more like natural human speech, than a typed search query. Marketers optimizing content for voice search should think in long phrases, whole sentences, questions and answers, rather than short keyword phrases. Think of how someone would ask you in person for the information you’re providing, and make sure your content addresses that type of query. Voice and visual search ultimately lead to the same result: A screen displaying search engine listings. Search on home assistants like Google Home and Amazon Echo do away with the screen entirely. The entire interaction is verbal – you ask a question, the smart speaker responds with information. There are over 35.6 million of these voice-activated assistants on the market right now, a 129% increase over last year. As these devices get smarter and cheaper, we can expect sales to continue to soar. One of the reasons these home assistants are appealing is they simplify search results. Instead of a page of listings, they give a single definitive answer. To optimize for that type of search, marketers need to pay close attention both to local search and to sites that partner with home assistants, like Yelp and CitySearch for business reviews. For marketers, the point of a search is for the user to click on our link in the SERP and read our carefully-crafted content. For consumers, the point of search is most often to get a single piece of information. Google is on the consumers’ side in this case – they’re constantly adding new features to keep people from having to click search results. Basically, Google pulls content from one of the top 10 search results and displays it, along with a link to the source. According to Ahrefs’ exhaustive snippets study , these little answer boxes can “steal” nearly 9% of clicks from the top organic listing. And Google is doubling down on the feature, displaying multiple snippets per query, increasing the length of text appearing in the box, even adding a carousel of options readers can browse without clicking through. The good news for marketers is snippets most often appear for long-tail keywords. If your content is a comprehensive explanation of a topic with multiple sub-topics, you’re already optimizing for snippets. Searchers no longer have to dumb down their queries, which means marketers shouldn’t dumb down content to please a search algorithm. Search is getting more convenient, more conversational, and accessible across a wider array of devices. So it’s time for marketers to evolve our content to match. Unless, of course, your target audience is actually Tarzan.